October 10, 2018 / Frank Gilbane / Comments Off on Hey, Digital Experience Experts! 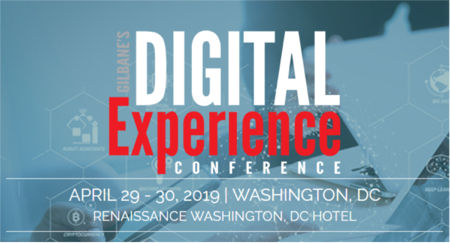 Don’t miss the opportunity to speak at our Digital Experience Conference in Washington DC in April. We’ll be covering the same content and digital experience technologies, strategies, and practices for marketing and the workplace we have at our previous conferences, including their alignment and integration. See our Call for Speakers for information about the conference tracks, instructions for submitting speaking proposals, and a link to the proposal form. Note the official deadline for proposals is October 12, however we will be extending it a week or so. If you are interested in speaking but need a little more time or have questions about potential topics, please contact me directly at frank@gilbane.com.